Whenever you are looking for furnished corporate suites Chicago then you need to consider staying at one of the many properties offered by Premier Luxury Suites. Our experienced professionals work hard to personalize every one of our properties, giving you a home away from home for all of your traveling, relocating, and vacationing needs. Each one of our properties has a great selection of amenities for our customers to enjoy, such as swimming pools and workout facilities. We also have properties that allow pets, so your furry friends can travel with you whenever you need to travel. The best furnished corporate suites Chicago can be found at Premier Luxury Suites. Whether you are traveling for business or relocating, you can stay in our of our amazing properties for the duration of your stay. Our properties boast several different amenities, including swimming pools, workout facilities, outdoor space, and much more. One of our properties even has its very own virtual reality golf course. We also have full kitchens, packed full of utensils, pots, pans, and other cooking supplies, allowing you to cook your own meals, rather than having to pay for fast food or hotel food, which can seriously add up. Another reason to choose Premier Luxury Suites when you are looking for furnished corporate suites Chicago is our wide selection of properties. 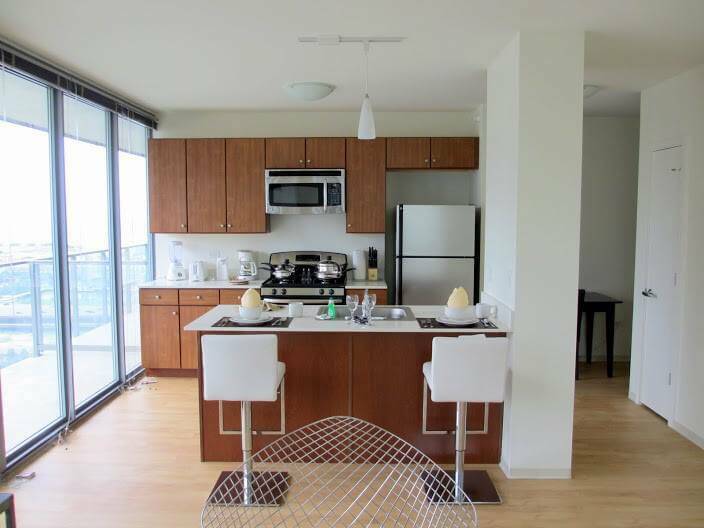 Some of the properties we have that are located in Chicago include Arkadia Tower, Grand Plaza, One Superior Place, Wolf Point West, and The Tides. All of our properties come with a fully equipped kitchen, high speed internet, telephone, cable TV, DVD player, and an iPod docking station. Our downtown locations also come with weekly maid service. So, if you are looking for furnished corporate suites Chicago then you need to check us out and see what we have to offer you. Premier Luxury Suites is the best place to go when you are looking for incredible furnished corporate suites Chicago. Our experienced professionals will provide you with a personal level of service that cannot be found in a hotel. Whenever you are going on vacation, traveling for business or relocating, our properties are there to give you that feeling of home that hotels just can't provide. We encourage everyone who is looking for a place to stay while traveling to Chicago to consider all of the pros of choosing to stay at one of our properties instead of some hotel. As you can see, Premier Luxury Suites is the place to go when you are looking for furnished corporate suites Chicago. Our properties are designed to provide you with all of the amenities you could possibly need, while also keeping it homey. After all, our number one goal is to provide you with a home away from home whenever you have to travel to the Chicago area. We hope that everyone will go online and check out our website, where you can look through all of our properties and see which one will be right for you. We hope to hear from you soon at Premier Luxury Suites.